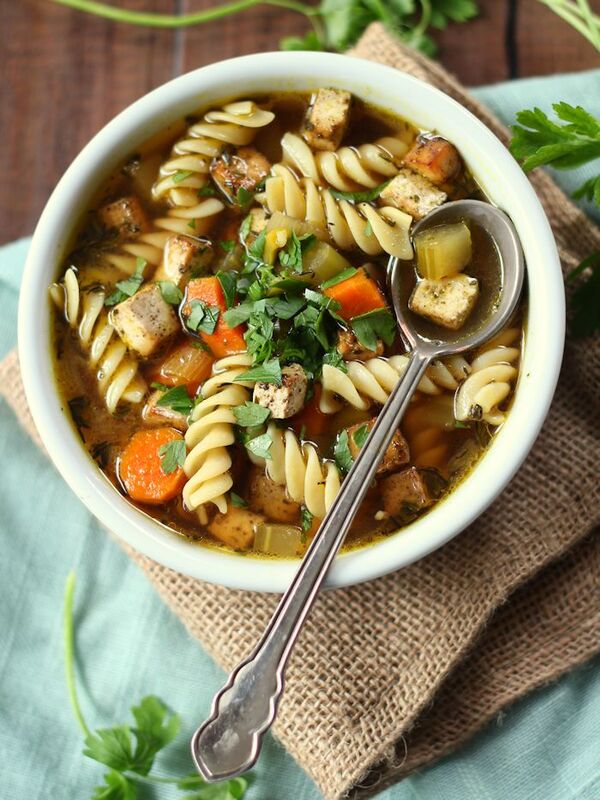 This cozy vegan chicken noodle soup features savory baked tofu, lots of noodles, and tender veggies simmered in seasoned vegetable broth. Tastes just like the stuff mom used to make, without the meat! I went a bit off track last week and shared something sweet in the middle of the week, so now I’m going to continue with the trend and share something savory over the weekend Boy, things are getting crazy around these parts! Also, it’s a chilly, overcast Sunday where I’m at, and as I might have mentioned before, it was a heck of a week. 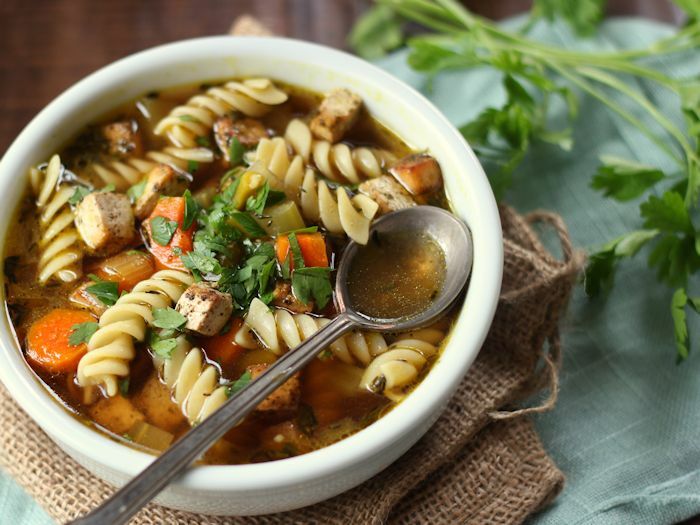 What better way to unwind and restore than with a cozy bowl of vegan chicken noodle soup? This one has honestly been a long time coming. 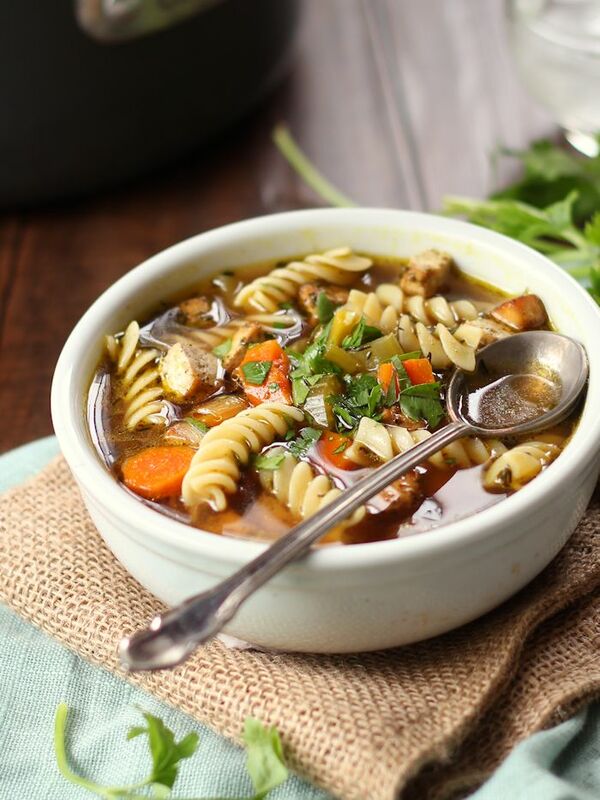 It was before I even started blogging that my husband (who I really have to thank for much of the motivation and inspiration behind these recipes) asked if I could create a vegan chicken noodle soup. A few years later I’m happy to say that the answer is a resounding yes. I almost used seitan in place of chicken here. It would certainly make things easier and seitan more closely resembles chicken. In the end I decided against it because (1) you guys generally seem to prefer tofu, and (2) concocting a savory tofu for this soup sounded like lots of fun. And fun it was. Delicious too. I dug the seasonings big time, and I’m pretty darn sure this formula will make a repeat performance in at least a few other recipes this winter. If you prefer seitan, feel free to substitute it for the tofu. No need to bother with the marinating and baking though. Just chop it up and brown it a bit, or go super lazy and skip the browning. Wait, poultry seasoning…doesn’t that contain poultry? The only poultry seasoning I’ve ever come across is just a blend of herbs, but check the ingredients just to be safe. I used McCormick brand, and I can confirm that that one is vegan. What about the pasta. Doesn’t that contain egg? Dried pasta is generally vegan! There are a few exceptions, like egg noodles, so check the ingredients before buying. Look for liquid smoke near the barbecue sauces at your supermarket. To keep this recipe gluten-free, use gluten-free pasta and gluten-free tamari instead of soy sauce. Need some guidance on how to make my vegan chicken noodle soup? Check out my video! Stir together broth, soy sauce, white wine vinegar, poultry seasoning, olive oil and liquid smoke in a medium bowl. Add tofu cubes and toss a few times to coat. Allow to marinate about 30 minutes, until most of the liquid is absorbed, tossing occasionally. Preheat oven to 400° and line a baking sheet with parchment. Arrange tofu cubes in an even layer on parchment and bake until lightly browned, about 30 minutes, flipping halfway through. Remove from oven and allow to cool. While tofu bakes, coat the bottom of a large pot with olive oil and place over medium heat. When oil is hot, add leeks, celery, carrots and garlic. Sauté until vegetables are slightly softened, 5 minutes. If using wine, add it now and bring to a simmer. Allow to cook, uncovered, until liquid is reduced by half, about 5 minutes. Add broth, thyme and bay leaf. Stir a few times and bring to a simmer. Allow to simmer for about 20 minutes. Season with salt and pepper to taste. While soup simmers, bring a large pot of water to a boil. Add pasta and cook according to package directions. Drain into a colander and toss with a bit of olive oil. If you're serving all of the soup right away, add the pasta and the tofu, then ladle into bowls. Othewise, divide the pasta and tofu into bowls and ladle soup overtop. Sprinkle with parsley. Store the leftover soup separatedly from the pasta and marinated tofu to avoid it getting soggy/losing flavor. Feel free to substitute seitan or your favorite savory marinated tofu. You can skip the marinating and baking steps if you do that. Great recipe! This was a hit – the tofu was delicious, I wanted to eat it all before it hit the soup. I used Old Bay Seasoning and Sirracha instead of poultry seasoning and liquid smoke. Can’t wait to make again! This looks super yummy! Definitely worth the wait! This recipe was amazing! My boyfriend and I loved it. Yay! Glad you enjoyed it! Thanks Kaitlyn!! This is resting on the stove right now. My diet is more restricted (vegan, gluten free, soy free) so I made some changes. Rice noodles, no soy sauce and Jackfruit instead of tofu. I made the marinade, simmered the Jackfruit in that, then diced it. Cooked the noodles in the broth to save a pan and it tastes great. Next time I’ll use a little more water and less broth. I’ve been wanting a soup like this for ages and I love poultry seasoning. Those sound like great adaptations! I hope you enjoy it! Love this recipe! I did add a little lemon-pepper and onion powder to the broth. So delicious! That sounds delicious! Glad you liked it! Thanks Julie! I’m glad you liked it! YUMMY! I will make this again and again.